Christian ministry offering hope to the poverty-stricken children of Haiti/Dominican Republic who lack the basics of food, water, medicine. We provide food and medical care, build churches, schools and housing for poor families, and support an orphanage. In 1971, my wife Sherry and I made our first missions trip to Haiti. 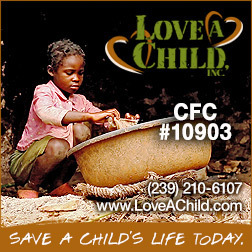 The plight of the poor Haitian children living in extreme poverty broke our hearts. For many years we visited the country with any chance we had, trying to help each handful of children that we could. Through the years, the draw of Haiti and its children became like a magnet. We found ourselves spending more time in Haiti than we did in the States. In July of 1991, we heard the "call of God" upon our lives. On July 1st, 1991, we moved to Haiti as full-time missionaries, by faith. We obeyed the calling of God in order to provide food, medical care, Christian schools, churches, a loving home to many orphans, and sustainability development projects in Haiti. We were there through the Embargo; through the military coups ... we were there through all the political problems of the Aristide regime. We faced much heartache with the Haitian people and will continue to work to ultimately empower Haitians to break the cycle of poverty.